This all-in-one leather-like protective case also serves as a portable workspace. Unfold the origami-style cover and it becomes a stand, holding your tablet in place as you type. The attached, low-profile keyboard has a soft, fabric feel. Connect your device via Bluetooth, and type away—anywhere. Dimensions: 9.56" x 7.63" x 0.25"
Amazing. Love it. Lightweight and easy to carry. Purchased as a Christmas gift. It looked better in person. It was smaller than I envisioned but it served its purpose. iwerkz’s compact, convenient keyboards keep you connected, wherever you are. Their designs are intuitive and easy to use, and work with your own devices via Bluetooth. Which iwerkz keyboard you choose depends on your preferences and needs. The Waterproof Keyboard can handle spills and the keys offer the tactile experience of typing on a laptop. It folds neatly into a hard plastic carrying case which also doubles as a stand to prop up your device. The larger PortFolio is a leather-like protective case that also serves as a portable workspace. Unfold the origami-style cover and it holds your tablet—strong magnets keep the stand in place. 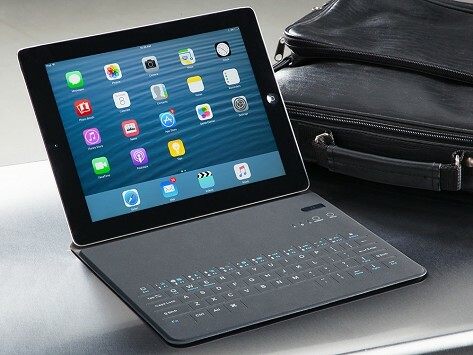 The low-profile keyboard has a soft, fabric feel that is like pressing a remote control. If you’re killing time at the airport or just sitting at your kitchen counter, any surface is instantly your desk with an iwerkz keyboard.